View More In Flash Cards. 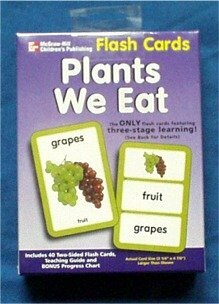 The ONLY Flash cards featuring three-stage learning! Stage 1 Introduction - Children are first introduced to the concept with a single picture and word. Stage 2 Practice - Then, they practice their knowledge of the concept by direct application. Stage 3 Application - Finally, they apply the concept in a series of fun games that involve sorting, matching, pairing and sequencing. Includes 40 Two-Sided Flash Cards, Teaching Guide and BONUS Progress Chart. Actual Card Size (3 1/4" x 4 7/8"). These games not only teach the concept at hand, they help children develop the important critical thinking, reasoning, and math and reading skills they will need in the school years ahead. Look for all the titles in this series. The ONLY Flash cards featuring three-stage learning! Stage 1 Introduction - Children are first introduced to the concept with a single picture and word. Stage 2 Practice - Then, they practice their knowledge of the concept by direct application. Stage 3 Application - Finally, they apply the concept in a series of fun games that involve sorting, matching, pairing and sequencing. If you have any questions about this product by McGraw Hill, contact us by completing and submitting the form below. If you are looking for a specif part number, please include it with your message.